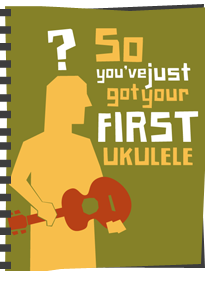 When I got my first ukulele, I was completely clueless. This was in those dark, long forgotten days before the internet had been discovered. I didn’t even realise that the strings weren’t supposed to go thickest to thinnest and restrung it. And get playing by following the beginner ukulele lessons. If you’re not new to ukulele but know someone who is feel free to pass it along. It has a Creative Commons license so distribute it as you wish.